I'm curious & wondering how many of you like the standard of pink for girls & blue for boy when making baby quilts? Please say your preference, & if not the standard what color you'd prefer. I don't really use ONLY pink and blue, but I try to make the quilts something that they will like even when they are older. I try not to make anything toooooo baby, just something that is nice. I'm rather fond of using yellow with splashes of other colors. Yellow is such a 'baby' color to me. I generally go with what mom wants, unless the baby is a little older. My favorite baby quilt I ever made was called "Sewfari", it was a really neat pattern. It had appliqued safari animals such as an elephant, a giraffe, a lion, etc. 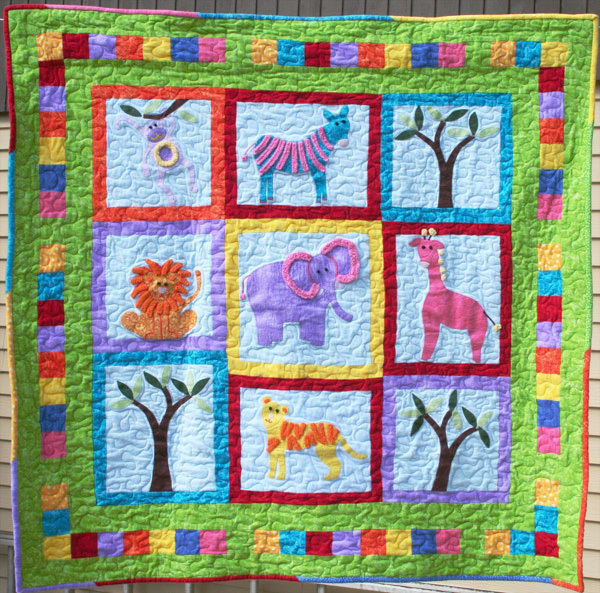 The animals had chenille trim, which added a wonderful texture to the quilt. I used all different colors - light blue, red, purple, yellow, green, orange - and I pieced the scraps together to make the binding. The mom told me a few years later, when the girl I made it for was about 3 or 4, that every night at bedtime she would pick a different color of the binding to hold onto when she went to sleep. It's a very happy quilt. Peckish I would love to see a photo! I am a pink or blue gal, green if necessary. I like bright colors, applique animals etc. If I don't know what the decorating scheme is I use primarily yellow and green. Totally depends on the personality of the mother. Blue is my favorite color to begin with so many quilts end up that color. I love pink with brown for girls. I always ask the mother (or grandmother) what the colors or theme is....quilts are for the new mothers in the beginning. It isn't till later on that the baby makes its wishes known - and if I see one of my quilts being dragged around or used to go to sleep by the little one that is the ultimate compliment to me. I'm currently making some baby quilts to have for those last minute gifts. Two have varying shades of pinks in them, one is browns and sunflower colors and the other is shades of blue for the boy babies. I also plan on making several that are totally neutral for that pile. I love b & w and super bright colors and shapes. those old pink and blue pastels don't do it for me or them. they can't see those pastels for a few months. Neither !! I use fabric that will last for years, and make the quilts almost twin size. My most recent one is Lime Green, White with a Fuchsia/Lime/Gold reproduction print with girls playing with beach balls. It's for a baby just born in the last week in San Diego, and the family loves the beach. I haven't made a real baby quilt in forever. I love seeing the older kid's still using the quilt they got as babies. Colors are at my whim. If a baby room is being done in a specific color and I know that I'll gear a quilt to that - sometimes... This little girl's brother got a Dallas Cowboys themed quilt when he was born. I don't use baby fabrics. Sometimes I use pastels. The last baby boy quilt I made had a tan background with tiny open stars on it and the pinwheels were all deep jewel tones in plums, navy, brick red and forest green. The last baby girl quilt I made had an ivory background with tiny taupe brown and gray flowers and the pinwheels were taupe brown, grays, four different white on whites and four different pale pinks. It was the most stunning baby quilt I've made so far. I usually pick colors and pattern based on what I think Mom will like. Sometimes I go with primaries and high contrast prints that are visually stimulating for baby. I also love the white on white heirloom look, but don't make many like that since I like to hope my quilts will be used a lot and well-loved. All depends on whether or not the gender is known. I also ask about the nursery theme. Friend of mine finally got photos of her grandson's nursery. She said country but it's more like the forest. So I'm thinking of a rail fence with forest babies. My niece is expecting a girl and really doesn't like pink but likes gardens, so I'm going with garden visitors like butterflies, bees, fawns, bunnies, lady bugs, flowers. Again a rail fence pattern around for the border and also some little worms/caterpillars. Corn flowers, Dresden plates. Just things like that. LOL feel like I am the baby quily expert lately. I have made 5 in the last 3 months and 2 pieced and ready to sandwich now. I am using pink and blue for the ones now with bright yellow, a lavender and green and each has a dark color with bright designs. I don't like pastels but do try to use some on baby quilts. Peckish I would love to see a photo! I love bright, cheery colors. Primary colors are my choice, if I am just making one for 'just in case'. I do have a lot of panels and use whatever works with them. Peckish, I love your quilt! Thanks for sharing. Looks like lots of you like bright cheery quilts. I like brights, bold, black & white, and parent preference! I use all colors and not just pastels. If I use pink it would be for a girl, if I use blue it is for anyone. my favorite is yellow... goes with both. Rainbows in both pastels and bolds. Kids love bright colors and rainbows.